Cover of Prof. Dr. Peters’ book. The crisis in Venezuela is of major concern to Colombia. The migration of many Venezuelans to Colombia, but also thoughts about a coup d’état or military interventions in Venezuela fill the pages of newspapers and the social media. In order to offer a deeper analysis on the causes of the Venezuelan crisis, the academic director of the CAPAZ Institute, Prof. Dr. Stefan Peters, has recently published the book “Sozialismus des 21. Jahrhunderts in Venezuela. Aufstieg und Fall der Bolivarischen Revolution von Hugo Chávez” edited by the German publishing house Schmetterling Verlag. The book begins by trying to understand Venezuela as a rentier society and argues that more emphasis must be placed on the particularities of rentismo to understand Venezuela, but also other countries rich in raw materials in the Global South and in Latin America. In the book, Prof. Dr. Peters analyzes thoroughly the rise and fall of the Bolivarian Revolution and elucidates possible future scenarios for Venezuela. Peters, S, (2019), Sozialismus des 21. 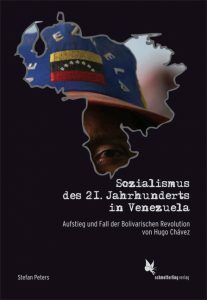 Jahrhunderts in Venezuela Aufstieg und Fall der Bolivarischen Revolution von Hugo Chávez, Stuttgart Alemania, Schmetterling Verlag.